Sitting on a car like they own the place. They already run the canals but now they're branching out to own the streets as well. 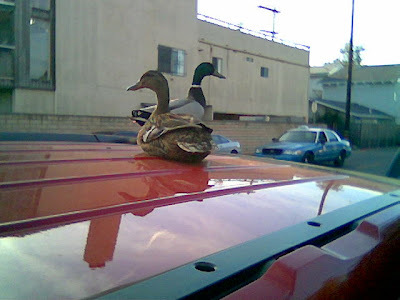 The owner of this car actually tried to get in and these ducks pecked his eyes out. Gruesome. I couldn't believe it. Don't mess with them or they'll do the same to you. Or worse, they'll crap on your sidewalk. You know that duck on top of the canal boat in children's TV show 'Rosie & Jim'? Well it turned out that it pecked everyone's eyes out too.